Once the holiday season is over in the South, I think we all just kind of accept that it’s pretty much summer again. Okay, maybe it feels like spring and we should probably embrace that before we all melt away come July but my heart can’t help but jump immediately back into breezy white tops and woven accessories. As always, I’m really into Cult Gaia bags and I especially like this round bamboo clutch. They’re certainly not bags that are practical for just tossing in whatever, but they add an interesting element to your look and are great for the beach, brunch, or other scenarios where you just need to carry a few things. I always consider white blouses to be a staple, so this Rag & Bone wrap top is an obvious must. It has that little twist of being a wrap top that will give you a sort of southern France vibe and can be dressed up or down. Wear it with jeans, printed shorts, a skirt, whatever. I feel like, when it comes to necklaces, I’m always talking about gold coin necklaces and probably need to branch out a little. I came across this gold and pearl pendant necklace and had to share because it’s absolutely perfect. It’s classic, but has a unique sculptural element that would look so chic with a black cashmere sweater or simple white t-shirt or even with a black t-shirt dress and sandals in the summer. 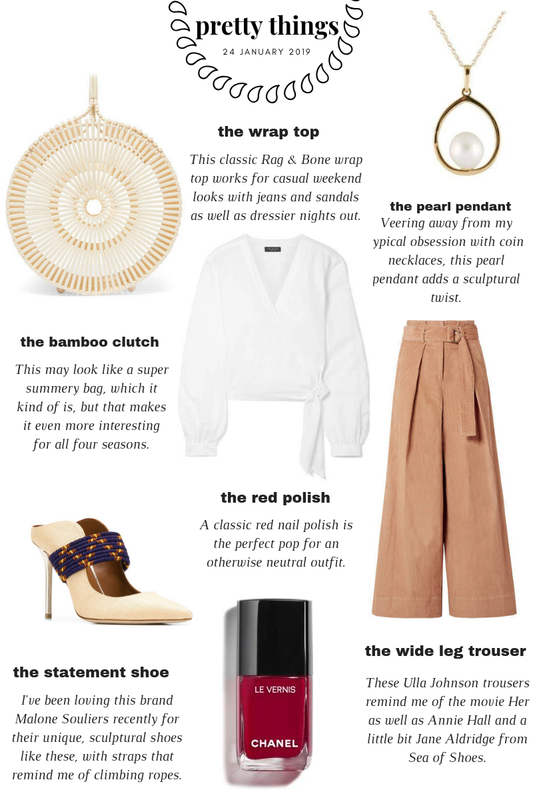 So, these Ulla Johnson trousers remind me of Joaquin Phoenix in ‘Her’ but also Diane Keaton in ‘Annie Hall’, and even Jane Aldridge of the blog Sea of Shoes. I feel like they’d be a great thing to wear in Paris with a basket bag and white tee. When you wear all neutrals, it can be nice to add pops of red with lipstick or nail polish. This shade from Chanel has a nice classic quality that’s timeless and chic. Have you heard of the brand Malone Souliers? I think I first saw them on Gal Meets Glam and I’m totally obsessed now. They make the most unique, sculptural statement shoes that are perfect to pair with neutral, basic outfits to step things up. This pair in particular caught my eye because they’re still rather neutral in color but the straps are made of these interesting cords that look like climbing ropes.